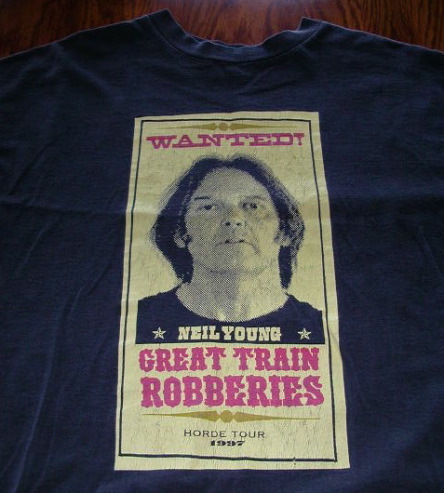 I got this at my second Neil Young show. For this one I only had to drive from Duncan BC to Portland OR. This was a great concert, because of the sheer number of bands, as well as the laid backness of it all. It was the second day of the tour and Neil's set was cut short so they could get movin' on, so no "Like a Hurricane". Neil played some songs off of Mirror Ball, without PJ, which I thought he'd said he'd previously never do. He also tried out new material, despite the army of tapers allowed at HORDE. Neil had also said previously he was done trying out new material live. Anyone who knows Neil, knows he reserves the right to change his mind and contradict himself. Highlights of the day were: Ben Folds Five (busted bass string and all), Primus fans moshing on hippie blankets and Magic cards, Neil of course, but the best set was turned in by the Squirrel Nut Zippers.